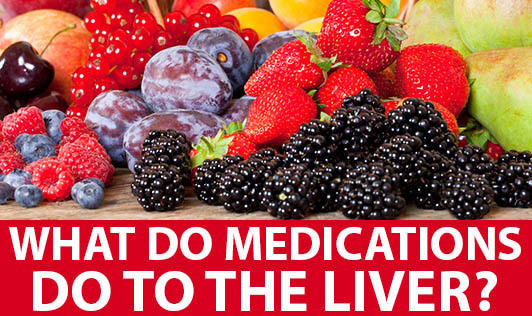 What do Medications do to the Liver? Most medications (drugs) have to be broken down by the liver to act on the body. When drugs enter the liver, liver enzymes are called in to deal with the drugs so that the drugs do not hurt the body. When more drugs arrive at the liver, more enzymes are called into action which means the liver is working too hard and it can be damaged. But this does not mean you should not take medications that are advised by your doctor. It only means you should take medications only if required. Avoid self medications and unnecessary consumption of medications. This will avoid the burden on your liver. What role does diet play in the liver health? The liver can get overloaded with toxins and other detrimental substances due to poor diet or unhealthy habits. Therefore it's important that you choose foods that will help maintain and support your liver. Good nutrition can also help to rebuild some damaged liver cells and help the liver form new cells. • Keep your weight in check -- obesity damages the liver. Exercise helps the liver by helping you maintain a healthy weight. • Cut down on deep-fried and fatty foods. Eat more fresh fruits and vegetables, whole grain breads, rice, and cereals. • Avoid any food you suspect you may be intolerant to. • Cut down on stimulants like tea, coffee. • Avoid excess salt and sugar. • Do not take large doses of vitamins, nutritional products, or herbal remedies without consulting your doctor or dietitian. • Avoid alcohol. Alcohol is known to be a powerful toxin that will damage the liver. • Limit usage of chemicals such as food colorings, flavorings and preservatives.